NOT able to obtain a blood return from CVAD? This might indicate a problem. If the tip of the CVAD is in the lower third of the superior vena cava at the junction of the SVC and RA, then you should get a blood return. If you can’t get a positive blood return, do not use and assess the cause. Do not expect patients to do arm and shoulder movements or what most nurses refer to as “central line aerobics” while you aspirate for a blood return. If this is the only way you can obtain a blood return. don’t consider this to be “normal” for the patient, this is an indication that’s there is a problem with the catheter. If unable to obtain a positive blood return, there is a problem with the central line and assess for possible drug precipitate, fibrin sheath, thrombus formation at tip of catheter, and mechanical problems such pinch-off syndrome, mal-positioning of catheter tip, or catheter dislocation. What if you called the physician and reported the problem (inability to obtain blood return) and you are told to go ahead and use the CVAD for infusion anyway. Should you? What does your facility’s infusion policies and procedures tell you to do in this case? If unable to get a blood return but the CVAD flushes well and when hooked up to an IV bag, fluid infuses well by gravity? Should you use the CVAD for infusion? Remember.… Assessing for blood return is one of the key indicators of a properly functioning CVAD and without a blood return, the use of the CVAD can put the patient at risk of serious complications. 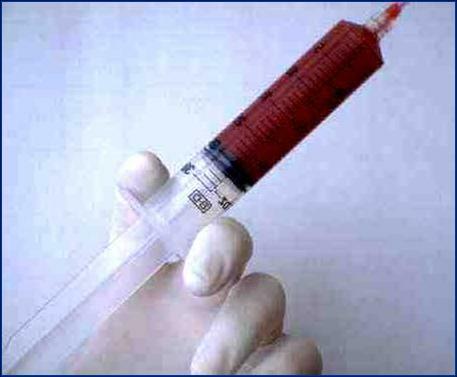 Positive blood return means a free flowing blood return easily obtained on aspiration, and the color of whole blood. In other words, bloody RED, not pink-tinged. If the CVAD tip is in the proper position, and the SVC being the biggest vein in the body, we should expect to get a blood return upon aspiration! Nicely written and all the questions that are asked and need clear definitive evidenced based answers.